Many pilots have asked us to provide a small “picture in picture” window, to show the entire flight track with the current aircraft’s position. This feature is now available both in the iPad’s Debrief tab, and on the web login. To display the window, check the PIP option, as seen in the picture on the right. Uncheck the PIP option to hide the window. 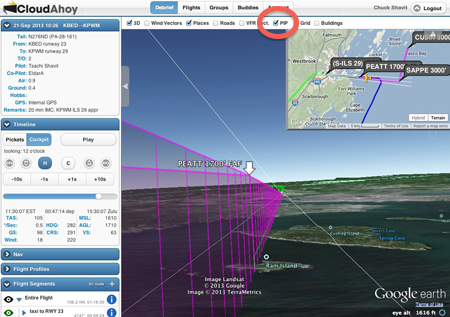 When displayed initially, the context window shows the entire flight path. Like the main window, you can zoom and pan the PIP window. To restore the display of the entire flight, click the Entire Flight segment. In the picture above, the main window displays cockpit-view animation of an instrument approach, and the PIP shows it in 2D, with the plane icon moving in sync with the main window. As always, let us know (dev@CloudAhoy.com) how useful is this feature for you. Can anyone tell me how to capture the CloudAhoy flight in a video for later incorporation with a video take with an HD GoPro? There are many tools for capturing the screen as video. Macs have a basic screen video capture built in, and if you are willing to pay a little there are more powerful tools. I am using a tool on the Mac called Camtasia. Similar tools are available on Windows.